Birds of prey hunt and eat birds, small and medium sized mammals, fish and insects or scavenge the carrion from a similar range of items and larger mammals. The term Birds of Prey is often only applied to diurnal (active during daylight) birds of prey, while nocturnal birds of prey are usually called Owls. Raptor is another word used to cover both daytime birds of prey and Owls. There are 39 species of diurnal birds of prey and 13 species of Owl that breed regularly in Europe. A comparison between the population sizes (in orders of magnitude) of birds of prey & owls and other European breeding birds shows the former have relatively small populations. This is clearly a consequence of their ecological position as predators, which will naturally result in occurrence at low densities relative to other species, notably their prey. It is also, however, a consequence of centuries of direct persecution and the indirect effects of other [human] impacts such as negative consequences of land use change or in some cases pesticide use. Of all European birds with populations of fewer than 1,000 pairs, 46% are diurnal birds of prey. Indeed, nearly a quarter (24%) of all species with populations of fewer than 10,000 pairs in Europe are diurnal birds of prey. (Stroud, 2003). Within a sometimes bleak European raptor context, Ireland has arguably the worst record concerning its bird of prey populations. Iceland has the lowest number of breeding raptor species but Ireland has lost a higher percentage of their native breeding raptor species than any other European country. As an island off the western edge of Europe, once we lose a species, Ireland is less likely to be recolonised compared to other regions, which may still be adjacent to areas holding healthy populations of a former species. Apart from passing migrants and vagrants from British populations, Ireland is not visited by numerous individuals from healthy populations elsewhere in Europe, especially by species now extinct in Ireland. For example, our Merlin population is augmented each winter by Icelandic Merlins but we have few records of Ospreys or Red Kites from mainland Europe passing through Ireland. In many cases we have to look for an expansion in the British populations, before we can hope for recolonisation of a former Irish species. Ireland always had a lower variety of breeding birds of prey than many other European countries, just as we have smaller avian and mammalian lists of species in general. The lack of voles (until their introduction into Limerick in the 1960s) may have been one of the reasons why we apparently never had a Tawny Owl population. Tawny Owl is the commonest Owl species across Europe. But there were also some peculiar historical reasons why Ireland lost such a comparatively high percentage of its former breeding bird of prey species. As elsewhere in Europe, birds of prey became extinct due to direct persecution or loss of habitat or a combination of both. Most of our bird of prey populations are likely to have declined between the 1600s and the early 1900s. Unlike many other European countries, Ireland remained a largely agrarian society throughout the 19th century because there was no noticeable shift of populations from rural to urban areas. The scale of deforestation in Ireland, from a largely wooded country to a landmass that only retained approx 2% tree cover in the 1800s, is rather difficult to visualise, the country must have been so bare. Many of our tree nesting raptor populations (Red Kite, Goshawk, Sparrowhawk, Buzzard, Osprey, Kestrel, Merlin and probably Honey Buzzard, Hobby and even Eagle Owl) would have crashed in line with the deforestation. Some species would have switched to other nesting opportunities, nesting on small crags (Kestrel) or on the ground among heather (Merlin). But the relatively isolated pockets of woodlands would have meant that the remaining woodland birds were more vulnerable to persecution. Just like the extent of deforestation around 1800, it is difficult to visualise approx. 8 million people living on the island of Ireland prior to the 1845 famine with the vast majority of these people were still living in rural areas. There are numerous records, usually from the more learned individuals at the time, denoting the threats that birds of prey posed to domestic fowl in the 18th and early 19th century. But it is hard to gauge what the genuine attitude toward birds of prey was among the farm workers of the time. But from the 1850s onwards the negative attitude to Irish Raptors hardens considerably, the cumbersome muzzle loading gun is quickly replaced by the breach loading gun, gamebird shooting becomes an important economic element among the landed estates, the run rig mixed farming systems is replaced by bigger estates, that were more focussed on profit, along the west coast. All these factors combine to ferment a genuine concerted effort to rid Ireland of many of its large predatory birds. The prevailing Christian and societal attitude in the 19th century was to tame and control nature and suppress all harmful wildlife. The Wolf had already been dispatched and birds of prey and other predators were now firmly in the firing line. The book by Gordon DArcy, Irelands Lost Birds, gives an excellent review of the changing attitude toward Irish birds of prey over the centuries and the slow and pitiful loss of several species. The status of Irish raptors reached its lowest point between the 1920s and the early 1950s, when Ireland had more extinct native birds of prey than existing breeding species. At this time Sparrowhawk, Hen Harrier, Peregrine, Merlin and Kestrel were regularly breeding in Ireland. Honey Buzzard, Red Kite, White-tailed Eagle, Marsh Harrier, Goshawk, Common Buzzard, Golden Eagle, Osprey and Hobby were extinct. There is still a debate as to whether Honey Buzzard and Hobby, in particular, were ever breeding Irish species and Ospreys and Red Kites can still cause debate to a lesser extent. But the nadir of only having just 36% (5 out 14) or even 42% (5 out of 12) of our original bird of prey breeding species remaining in Ireland has now thankfully been past. No other suite of Irish birds has been depleted to such a degree. Irish ornithology has properly focussed on our most important bird populations, from an International perspective, including breeding seabirds and wintering wildfowl and waders. But now there is a greater acceptance that there is also an onus, on the Republic of Ireland and Northern Ireland, to enhance their native Biodiversity, including Birds of Prey, while at the same time maintaining Biodiversity. But as we contemplate a brighter future for many birds of prey, we must not loose sight of our threatened raptors. The Barn Owl is now the most threatened Irish breeding raptor. It is on the extreme northern edge of its worldwide range and therefore vulnerable to slight environmental changes. But we still believe it can be conserved here through detailed research on its feeding and breeding requirements and subsequent targeted conservation measures. The Hen Harrier is our second most threatened breeding species and several years of detailed monitoring and policy efforts are now beginning to bare fruit in some parts of its range at least. It would be very unfortunate to loose both these species, as we look forward to the restoration of other native species. But equally, we need not wait for the Barn Owl and Hen Harrier populations to stabilise before we tackle the complete absence of so many of our native raptors. Due to increasing British populations, Ireland is now benefiting from natural recolonisation by several species. Since the 1950s, Buzzards have returned and are now steadily extending their range across Ireland. Goshawk, whether by recolonisation or release/loss of falconry birds, have also re-established a tentative population. Reintroduction programmes have also enhanced the Irish raptor status. 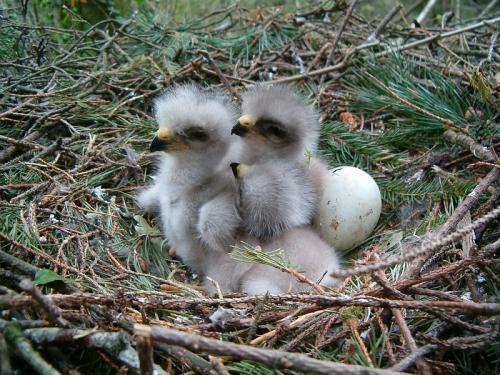 Golden Eagles have now bred in Donegal and hopefully in time will establish a viable population. Unfortunately, the expert opinion in Scotland suggested that the Golden Eagle population had shown no signs of expanding its range and productivity in the SW of Scotland, thus suggesting that a natural recolonisation of Northern Ireland and/or Donegal was unlikely in the near future. White-tailed Eagles and Red Kites have been released recently into County Kerry and County Wicklow, respectively. Again, there was no indication that natural recolonisation of Ireland from their respective extant populations in Norway or Wales was likely. Their re-introduced populations in Scotland, in particular, may have eventually spread to Ireland, which would have been a gradual expansion of a reintroduced population rather than natural recolonisation. We can also look toward the westward expansion of the British populations of Marsh Harrier, Osprey, Hobby and Honey Buzzards all eventually reaching our shores and once again replenishing our native stock of Irish birds of prey. After almost 300 years of terminal decline, Irish birds of prey are making a steady comeback and there are likely to be several welcome surprises over the coming years. After centuries of negativity, let us hope that the public attitude towards our raptors will once again be positive. Stroud, D. A. (2003). The Status and legislative protection of birds of prey and their habitats in Europe. In Birds of Prey in a Changing Environment, ed by D.B.A. Thompson, S.M. Redpath, A.H. Fielding, M. Marquiss and C.A. Galbraith. The Stationery Office, Edinburgh.